Oh, pretty sweater! Cozy up and enjoy the snow! That's what I'm *trying* to do today. We're enjoying the snow, too, in Kansas, although folks 'round here just aren't used to so much of it! I would love to just drop in to see what living with snow would be like, having never experienced it (except for a couple of short trips to try skiing). But I don't cope very well with the cold weather - what a pity you can't have snow without the cold! Good luck with the circular needles - I can't get my head around them, so I avoid patterns that use them. Gorgeous scenery. I just love freshly fallen snow. And the yarn is such a pretty color, and what a beautiful wave it has on the circular needles. Best for last: what a beautiful little sweetheart! That angle is just right, Jaime. The cheeks are shown to their best advantage. thank you for sharing your peaceful life. 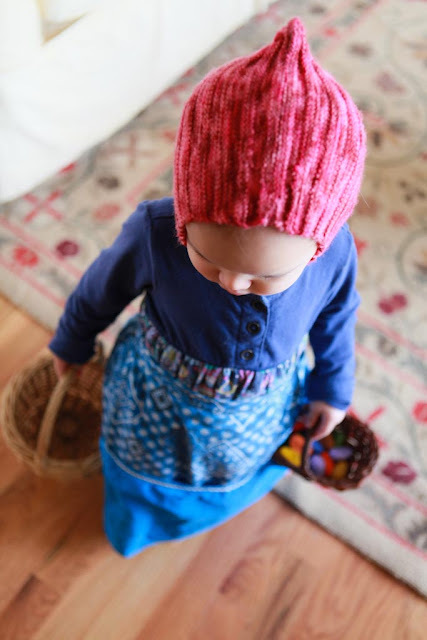 Love the bonnet on your little girl, Jaime! We're finally experiencing a real winter this year after several very mild winters. It's beautiful. 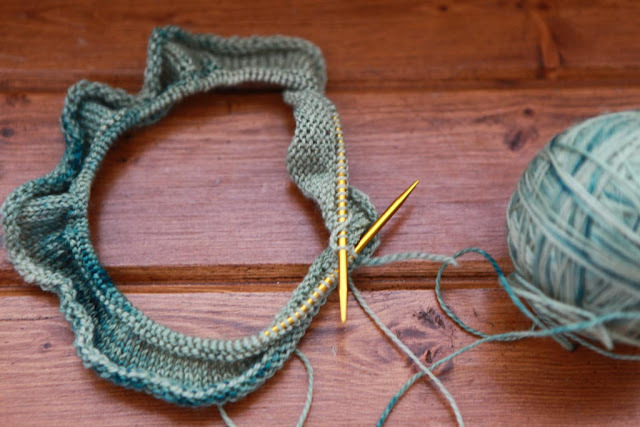 Circular knitting is pretty easy as long as you don't twist the first stitches and make sure to mark the beginning. But those needles are stiff. If the project isn't too big, I prefer to use double-pointed needles. I think we probably live pretty close to each other, but with the snow and the fact that I got the flu a couple of days ago, we could have a knit day snow day. All I can say is just keep practicing with the circulars. They do get easier. I always struggle at the beginning of a project just to make sure everything is even and straight. Good luck. Great shot of the inside of your "snow globe!" Love the photos, Jamie. Could your little one BE any sweeter?! I find circular needle infernal. I've tried multiple times, but just can't seem to do it. Double points make so much more sense to me. We were down in CO over the weekend and got to play in the snow. But, we don't have any up here back at home.